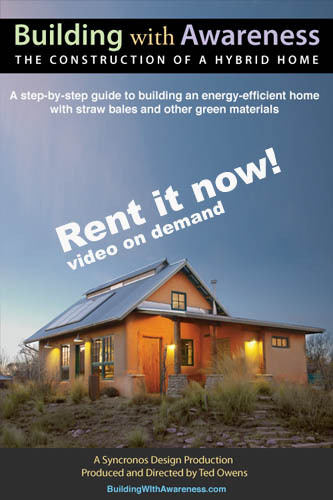 For the first time, “Building With Awareness”, the award-winng step-by-step video on how to build a straw bale home, is now available as a video-on-demand rental. We are very pleased to offer the full version of “Building With Awareness: The Construction of a Hybrid Home” for the ultra low price of only $4.99 for a 30 day rental. This is a limited time introductory offer, so please please pass the word around. Watch all two hours and forty-two minutes for this amazing low price. Learn about straw bale house construction, heating and cooling your home with solar energy and passive solar design, earth and clay plasters for walls, how to build an adobe wall, photovoltaic electrical systems, and much more. We still offer the book and DVD combo, however this rental is a great way to get inspired about green building for a very low price. Give it a try and watch it now on your computer, tablet, or phone.